LSU came out on top against Ole Miss volleyball in a five set affair on Wednesday in Baton Rouge. The loss drops Ole Miss below .500 on the year with a record of 13-15 (3-11). The Rebels jumped out to an early 6-1 lead in the first set, and appeared in control for most of it. After extending their lead to six points at 16-10, LSU went on a 5-0 run to tighten the game and force the Rebels into a timeout. 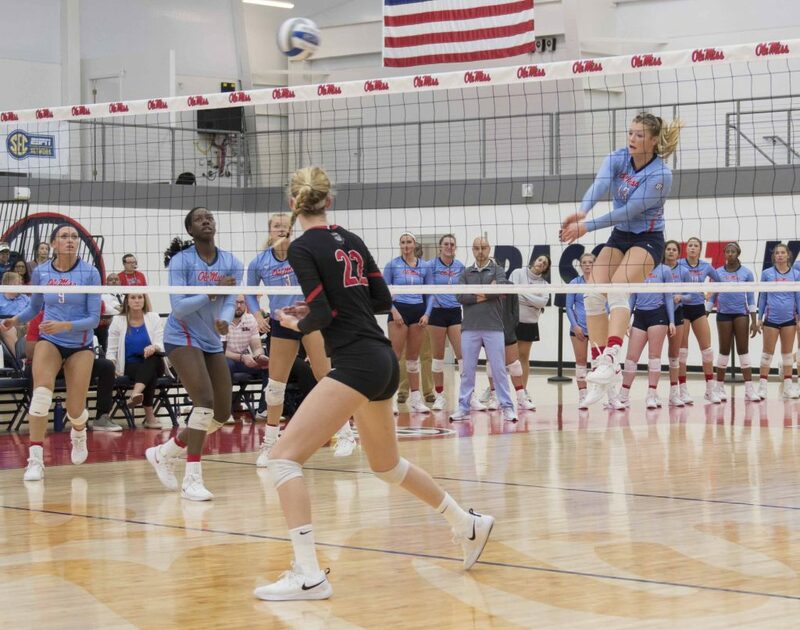 Ole Miss would never lose its lead, however, and held off the Tigers to win the set 25-23. Junior outside hitter Emily Stroup ended the set with six kills and one dig. Freshman middle blocker Aubrey Sultemeier recorded five kills. Sophomore setter Lauren Bars added 14 assists and two kills. The second set, much like the first, was controlled by Ole Miss early, but two back-breaking runs from LSU carried the Tigers to take the set. After the Rebels took an early 8-5 lead, LSU went on its first long run of the set, scoring six straight to take an 11-8 lead. This was followed by a 9-1 Ole Miss run to take a five point lead. LSU had the last laugh, however, going on a 10-1 run to bring it to 18-22. The Rebels couldn’t gain any ground after that, eventually dropping the set 22-25. After a fairly close start, the Rebels dominated the third set, opening it up with a 17-8 lead. The Tigers attempted to battle back, putting together a 10-5 run before the Rebels managed to close out the set 25-19 with a short 3-1 run. Stroup recorded six more kills in the third set, bringing her total to an impressive 21 through three sets. Sultemeier recorded one assist in the set to go along with three kills. Sophomore middle blocker Bayleigh Scott recorded one kill and two blocks. Bars had 14 more assists in the set, also recording two kills and a block. The fourth set was hotly contested all the way to the end, with the two teams trading points most of the way. The set saw 10 ties and 5 lead changes, and the largest lead held by either team was just three. After the teams battled to a 20-20 tie, LSU went on a 3-0 run to go up 23-20. This was followed by a 3-0 run by the Rebs, fueled by back-to-back service aces from Bars to tie it again at 23-23. After an LSU timeout, two powerful kills by the Tigers finished it off and forced a decisive fifth set. Stroup recorded seven more kills in the set, setting herself up for yet another 30-kill match going into the fifth set. Sultemeier recorded two kills and a block, and Sophomore outside hitter Leah Mulkey recorded two kills and two blocks. In the fifth and final set, the teams went back-and-forth in what ended up being the most competitive set of the night. The fifth set had 9 ties and 4 lead changes and was a proper way to cap off a thrilling season series between two evenly matched teams. Neither team was able to pull away, with ties at 8-8, 10-10, 11-11, 12-12, 13-13 and 14-14. After Ole Miss unsuccessfully challenged that an LSU player did not touch a ball that landed out of bounds, the Tigers came away with back-to-back kills to win the set 16-14 and clinch the match. Stroup recorded four kills in the set, giving her a total of 32 for the match, a new career and program record. This was her third 30-kill match of the season, and she showed yet again just how dominant she can be in close matches like this. Sultemeier had three kills in the final set, giving her a career-high 14 on the night on a .480 clip. She also finished the match with three blocks, two digs and an assist. Senior Caroline Adams also recorded a career-high for digs, posting 33 on the night. Scott contributed one kill and two blocks in the final set. Bars recorded eight assists in the set, finishing with an impressive 57 in the match. She also contributed 13 digs, giving her a double-double.